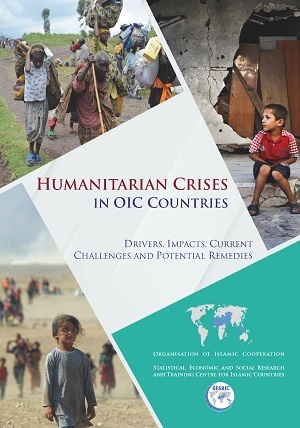 Given the increasing frequency and intensity of humanitarian crises in OIC countries, this report discusses the main drivers and impacts of humanitarian crises in a broader perspective, reviews the current humanitarian crises in OIC countries as well as non-OIC countries involving Muslim communities and offers potential remedies for prevention of humanitarian crises. While the discussions on the main drivers and impacts of humanitarian crises are typically all-encompassing, they are enriched with special reference to OIC countries and with case studies on major humanitarian crises in OIC countries. The report focuses on four main drivers as the root causes of humanitarian crises; namely, armed conflicts, occupation and oppression; political and economic stability and governance; climate change and natural hazards; and epidemics. While studying the major consequences of humanitarian disasters, five key areas for the assessment of the impacts will be reflected in this report. These are human deprivation; state fragility; economic collapse; human rights violation; and migration and displacement. After providing broad discussions on the drivers and impacts of humanitarian crises, the report examines the major current crises in OIC countries by specifically looking at major drivers, impacts and opportunities for recovery. The overall objective of this exercise is to develop a diagnostic study on the major humanitarian crises in the OIC countries. Thereby, it aims to promote joint initiatives on strengthening resilience to humanitarian crises in the OIC countries and advocate for collaborative actions for strengthening the institutional capacities for countries that experienced or continue to face destructive natural disasters and man-made crises, which may limit the operational and technical capacities of institutions. The remedies are provided in five sets of actions from a longer-term perspective to reduce vulnerabilities and build resilience in OIC countries.